First and foremost, what is restore iPhone? Well, generally it has two different meanings. One is restoring your iPhone to original factory settings and the other would mean restoring the iPhone from previously created backup. If the former function is performed, all the data on your iPhone would be completely erased and your iPhone would be reset to the original factory settings and all the data will be erased, i.e. it will have the same settings and data as that of a newly bought iPhone. And the other action means that the iPhone would be restored with the backup of all the important data which you would have earlier created for your iPhone. Here we will discuss how you can restore your iPhone in different scenarios. There are many scenarios during which you may need to restore iPhone to factory settings. You may have got locked out of your device or there may be some minor technical glitches in the performance of your iPhone. You can even perform a factory restore to make your device run and respond faster. Some ways to factory restore iPhone are given below. One way of restoring iPhone to factory settings is by using iTunes. But first, get the latest iTunes on your computer and turn off Find My iPhone feature from Settings on your iPhone. Now, follow the steps below to know how to restore iPhone using iTunes. Step 1: Open your PC/Mac and launch iTunes on it. Step 2: With the help of a USB lightning cable, connect your iPhone to the PC/Mac and click on “Trust this Computer” if prompted. Step 3: On the upper left corner of the screen, click on “Device”. A list of options will be available on the left side of the screen, click on “Summary” from the list. Step 4: Click on “Restore iPhone” on the right side of the screen. Step 5: Then click on “Restore” to confirm. iTunes will now erase all the data and settings on your device and the latest iOS software will also be installed in the iPhone. If in case your iPhone is frozen, dead or disabled, iTunes won’t be a suitable option anymore. In such a scenario, you can use the highly recommended software iMyFone D-Back which resolves and fixes many major system issues in your iPhone even if it’s frozen/stuck or disabled. 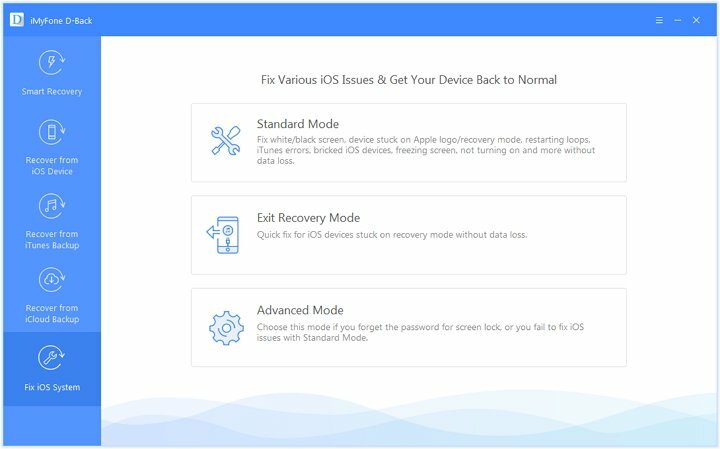 The Advanced mode with it can fix serious iOS problems while restoring your iPhone to factory defaults. Therefore, if iTunes cannot restore the problematic iPhone, you can use this to easily factory restore following the steps below. Step 1: Download iMyFone D-Back software on your PC/Mac and launch it. From the left menu click on “Fix iOS System” and then choose “Advanced Mode” to proceed further. 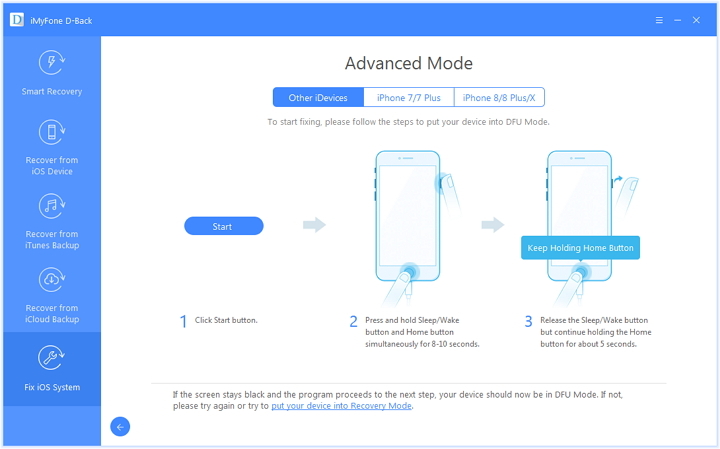 Step 2: Connect your device and follow the onscreen instructions to put your device into DFU mode/Recovery mode first. Step 3: Download the latest Firmware by clicking on “Download” when prompted. 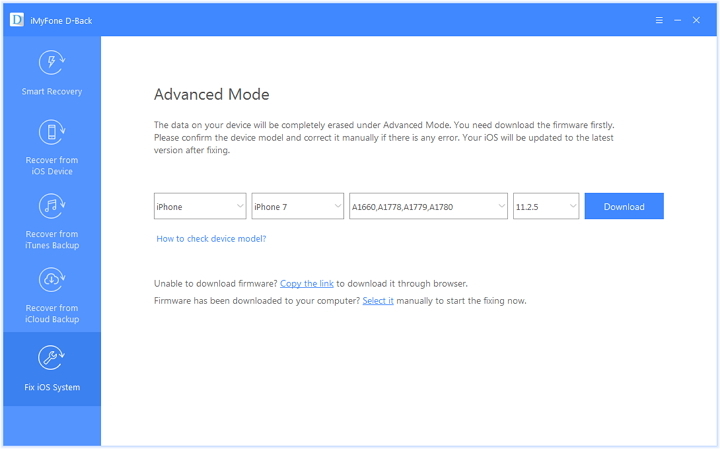 Step 4: After the Firmware is downloaded, click on “Start” to start the process of resetting your iPhone. The restore progress will be shown on the screen and once the issue is fixed you will be notified. While restoring, this software will also fix all the problems that caused your iPhone frozen or disabled. After that, you will need to set up the device. If you want to restore iPhone from backup in iCloud or iTunes, you can follow any of the two methods explained below. 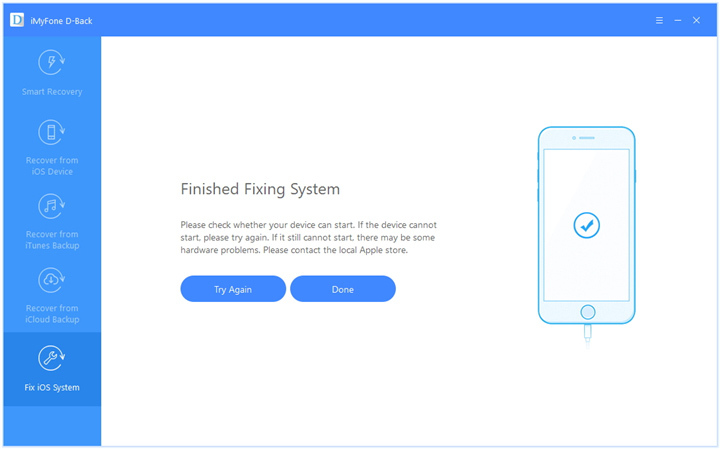 If you do not wish to use iTunes or iCloud backup to restore and recover your phone’s data, a very effective software called iMyFone D-Back iPhone Data Recovery can be used. 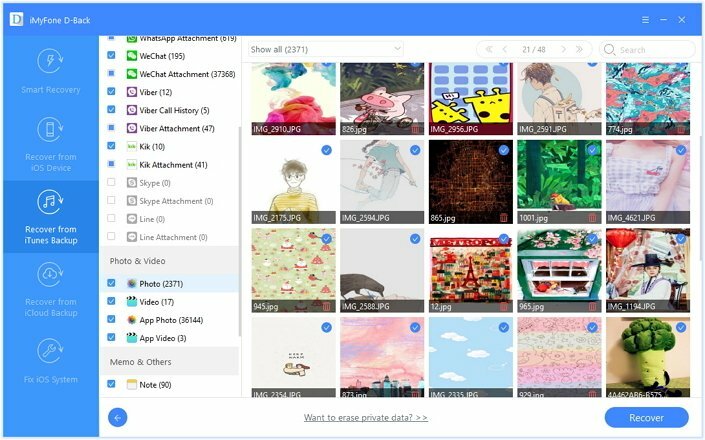 By using this software you can easily restore accidentally deleted or lost data along with the backed up files and folders. You can selectively extract and restore files from backups. This feature is absent in other methods here. There is no data overwrite on your iPhone. iTunes and iCloud restore will erase all the current data . Preview files before recovery, which is not supported with iTunes/iCloud. So, iMyFone D-Back is clearly more feature-packed and efficient. 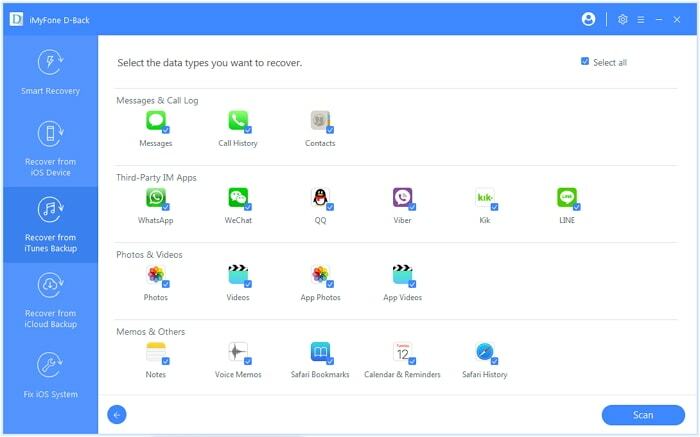 You can use this software in the following way to restore iPhone from backup. 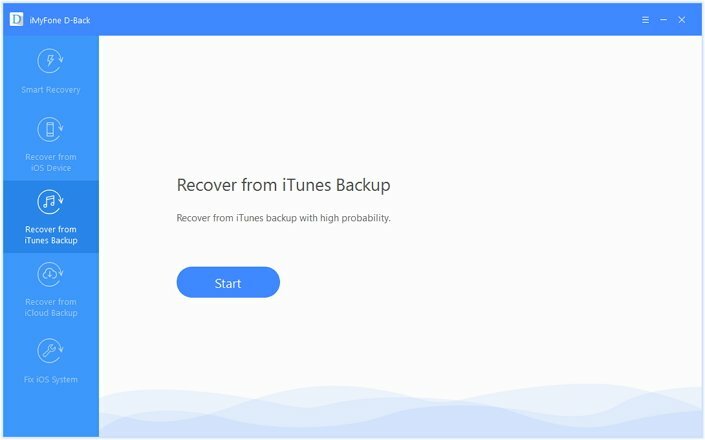 Step 1: Download, install and launch iMyFone D-Back software on your PC/Mac and click on “Recover from iTunes Backup” from the options available on the left side. Step 2: Choose an iTunes backup you need and click “Next”. Step 3: From the provided files types, select those you need and hit the “Scan” button. Step 4: The software will then scan and show all the files after the scan is over. You can preview the files which you want to restore and then click on “Recover”. Optionally, you can choose to restore from iCloud backup. The steps are basically the same as described above, except that you need to login iCloud account. You can restore iPhone from iCloud backup as well by following the detailed steps given below. Step 1: From the main menu on your iPhone, go to the “Settings” option and choose “General” settings from there. Step 2: From the options available under General Settings, choose “Reset” option and go on to tap on “Erase all Contents and Settings”. 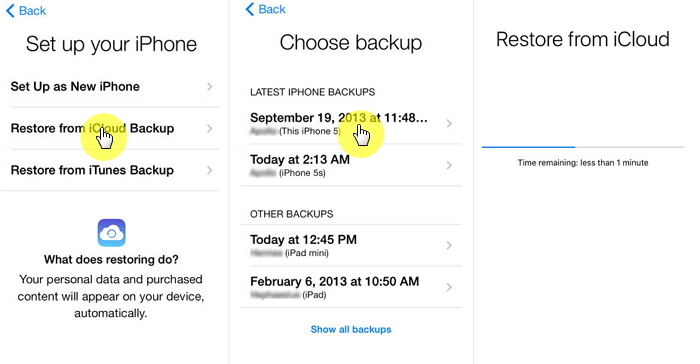 Step 3: The setup screen will display all the instructions, follow them and then tap on “Restore from iCloud Backup”. Step 4: You will be asked to sign in with your Apple ID and then from the many backups available you can choose whichever you prefer to restore it to your iPhone. 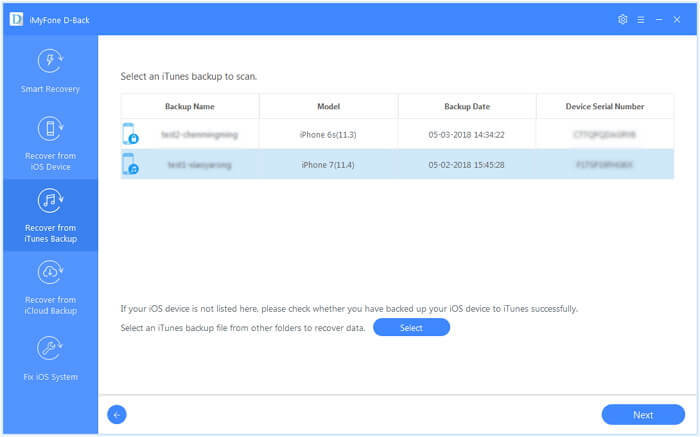 This is a simple way of restoring your iPhone from iCloud backup. From the iTunes panel, you can easily restore your iPhone by following the steps mentioned below. Step 1: Connect your iPhone to PC/Mac with the help of a USB cable and then launch iTunes app. 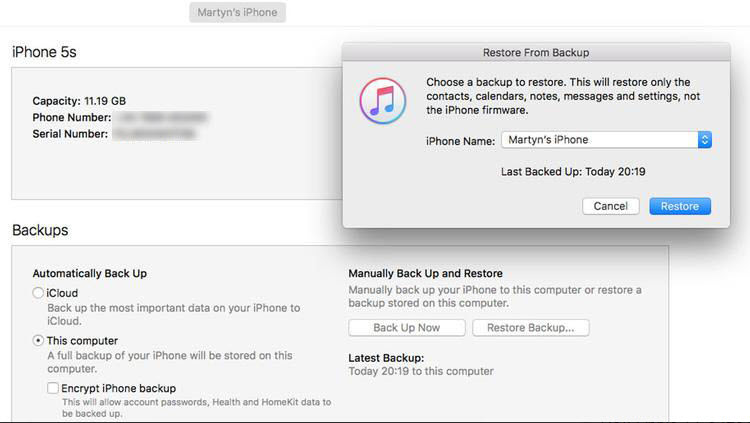 Step 2: In case your device is new or if it has been erased, a prompt screen will appear which will ask you to restore your iPhone from iTunes backup. Step 3: If it is not prompted, go to the “Devices” option and click on your iPhone. Step 4: From the options available on the left side, click on “Summary” and then click on “Restore from Backup”. Step 5: Select the backup from the list available which you wish to restore and click on “Restore”. Through these steps, you can quickly restore your iPhone from iTunes backup. There are many traditional ways to restore your iPhone. But, iMyFone D-Back are very effective in performing these functions in a very simple way without consuming much time, and therefore these are highly recommended for this operation. Go for them!